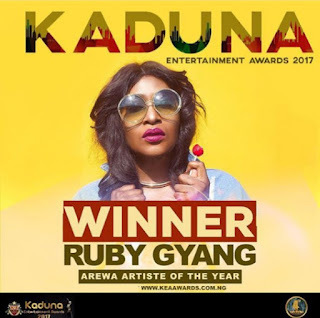 The 2017 Kaduna Entertainment Awards which was held on Friday night at the Afrinet Bluebreeze Centre in Kaduna can never be forgotten even in a hurry. It was the fourth edition of the annual award which is aimed at celebrating entertainers and change makers in and out of Kaduna state with the backing of the state government and other prominent personalities. E-Man and Hanny were the hosts of the night and they did pretty well by commanding proceedings. Chocolate City singer, Ruby Gyang who was nominated in the category of "Arewa Artiste of The Year 2017" beat everyone to cop the award. However, Chocolate City took to instagram to congratulate her on winning the award with a beautiful photo art. Congratulations to her! Arewa loves your art and music!! Keep it up!! !